The Luck Wafer (エレメンタル・フォース?, lit. 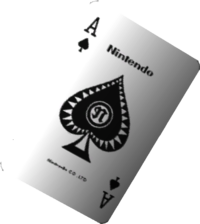 : "Elemental Force") is an ace of spades playing card and a treasure in Pikmin 2. It has a spade icon of which has an "N" in the center, with the word "Nintendo" labeled across the top. On the bottom there is a lengthy but illegible word and the abbreviations 'CO' and '.LTD', identifying the previous word as the manufacturer's name. This treasure references Nintendo's origins as a hanafuda (playing card) maker. It is found on sublevel 4 of the Hole of Beasts and is located in a twisted alcove near a Violet Candypop Bud. A glitch can cause Pikmin who carry this part to mysteriously fall through the ground, making it difficult to carry at times. The Luck Wafer being analyzed. Artwork of a Blue Pikmin carrying the Luck Wafer. A concept art featuring the Luck Wafer. A real world ace of spades. This page was last edited on December 12, 2018, at 08:43.